We preview England, a youthful squad revamped under Gareth Southgate that hope to excite through high energy attacking play in an uncharacteristically English way. For the first time in England’s long storied footballing history they are heading into a World Cup with signs of promise. A squad filled with youthful exuberance with an average age of 26, only five players of the 23 scarred by previous World Cup experience, only three players over the age of thirty, 17 of the 20 outfield players represent clubs in the Premier League top six, genuine world class players, and a coach who whilst many think underwhelming, knows what he is doing. England sailed through qualification from a relatively unchallenging group undefeated with 8 wins and 2 draws. This could’ve been a challenging period for the side as Sam Allardyce oversaw England’s first game in qualifying a 1-0 win over Slovakia, and was quickly dismissed after only one game, (maintaining his 100% win record at international level), due to bribery, corruption and general things you probably shouldn’t do as England Head Coach. Southgate was quickly appointed to head coach from his role as U21 coach which he had held from 2013. England’s squad for the tournament has a very interesting makeup, with arguably only Kyle Walker, John Stones, Harry Kane and Raheem Sterling considered “guaranteed starters, this could be seen as a positive as lots of England’s personnel offer different attributes. We can see this in the ongoing debate between the choice for starting Goalkeepers, although at the time of writing, it seems Pickford will be Southgate’s starting number one. England and in the battle of the starting #6’s, the author is hoping Southgate opts for Henderson over Dier though. After watching England’s friendlies against the Netherlands, Italy, Nigeria and Costa Rica, it’s clear to see that Southgate will opt for an attacking 3-5-2 with wingbacks pushed high, in line with the two #8’s who occupy the half-spaces and Sterling with a free role in front of this band of four. Kane is then tasked with staying high and occupying the back line, with Sterling either supporting close to him or dropping deeper to aid in build-up. It should be noted that England’s situational midfield diamond has players of contrasting attributes. Lingard is a great outlet for carrying the ball, and evading pressure, he often looks to head wide to combine, but when he decides to dribble vertically he is far more effective, he plays with a fantastic level of intensity which is vital to England’s system. Dele Alli is a strange mix of player, he often looks to run past Kane without the ball, leading to quality chance creation as seen at Tottenham. He is very good in combination play, with a vast array of flicks and one-twos to beat the opposition press, and he’s a very accomplished dribbler with an erratic approach to beating players. Alli is exciting to watch, but he also is very intense off the ball, no doubt playing under Pochettino has taught him how to appreciate space defensively, and how to close spaces with his body shape, Alli is very good defensively. In the friendly game against the Dutch, Southgate opted to use Sterling dropping from the #10 space with Oxlade-Chamberlain and Lingard pushing high into the half spaces between the four Dutch central players. This allowed them to manipulate the movements and behaviours of the whole Dutch midfield, and played havoc with their defensive structure. Because of this, the immobile Bas Dost was tasked with shutting down Henderson in the six space and was often found behind Henderson applying no pressure on him, allowing Henderson plenty of time to play the ball into either #8 in the half space, to combine with Rashford or Sterling. England’s shape in build-up has remained the same regardless of personnel over the course of the past 4 friendlies. Henderson or Dier will remain in the #6 space to create a diamond in the first phase of build-up, usually creating a 4v2 or 4v1 situation, the sidebacks, Walker or Cahill/Maguire will often move wide after the pass from the goalkeeper. In these situations, it is clear to see who has been coached by Guardiola and who hasn’t, Walker and Stones, as the back three split offer very good spacing, with Cahill and Maguire have shown to be often far too wide to assist in the first phase. The ball is usually passed into Henderson or Dier, Henderson will then look to play forward quickly, usually into the feet of a midfielder, or a diagonal pass into the moving wing-back. Dier is very different in this aspect and will often look to play backwards. If the ball isn’t passed centrally into the #6 player, Stones will often drive into the #6 space and look to play a long flat pass into a wing back, or into the feet of a central midfielder. The final option England have often shown to take up, is after the first pass, a side back will pass to their nearest wing back, for a quick one-two, after the wing back receives the ball back they will look to combine with the #8 in the ball-near half space to play to Kane quickly. John Stones plays a vital part in England’s build up under Southgate. He can often be seen stepping up into the #6 space to play alongside Henderson/Dier. 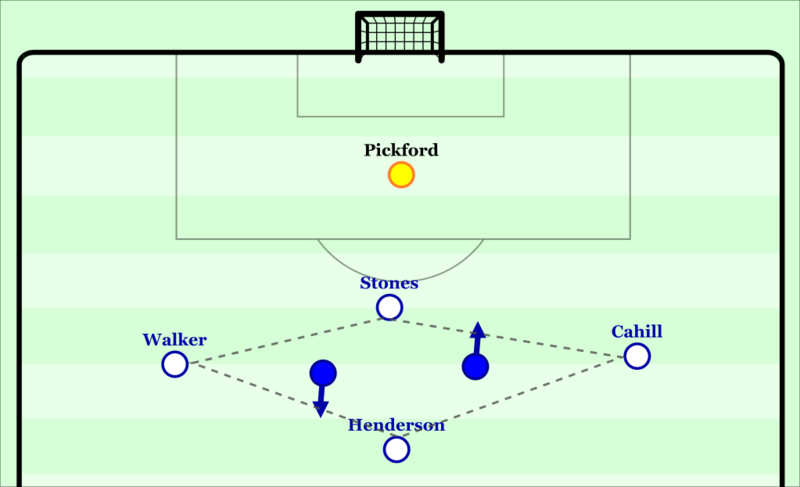 A common scene that occurred especially in the Holland game would be, Henderson having the ball, attracting a singular pressing player, to move the ball quickly to a nearby Stones who would then look to quickly break lines and play a penetrative pass into the half-space. Stones is by far England’s best centre back with the ball at his feet, and the role given to him in the middle of the back three suits him perfectly. He is often seen driving into space with the ball at his feet, and is always looking to play low, flat passes into the feet of the CM players, who look to have been instructed to look for this when Stones is on the ball. The best thing about having Stones in the centre of the back three is that he is prone to a few ball losses per game, and alongside the aggressive Walker, and the more cautious Cahill, England have enough security to regain possession after it is lost in this manner. England have been very good at creating chances from attacking transitions in the past few months, when the ball is won back, the often attack with no less than five players, (Two #8’s, #10, #9 and the ball-near wing back). 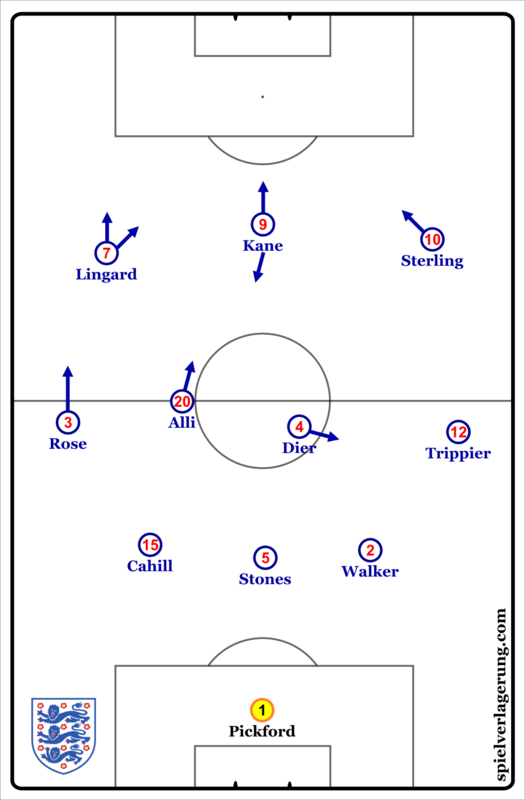 The pattern often changes depending on which #8 is closest to the ball, winger-hybrid player Lingard likes to run toward the wide area, to play a quick combination with the wing back and Sterling, who will move toward the touch line to open up space to penetrate the box, whereas Alli will often run beyond Kane to attack the box in transition, Kane is fully aware of this, and often looks for Alli via flick on’s into the box. Henderson or Dier will often sit to create the diamond just past the half way line, after the ball is one in offensive transition, with the ball far wing back often joining the attack, after the first ball progression. One player I must mention, who impressed me greatly in offensive transition, was Ruben Loftus Cheek, who would often receive the ball after the transition, beat one or more players with his fantastic mix of press-resistance and strength, and instantly orient himself to the attacking player closest to goal. This is a nice change of pace in the England midfield area, as Dier would often win the ball and take far too long to make a decision, with players running forward before he executed a movement, resulting in poor offensive spacing, Henderson can sometimes be overzealous, and look to hit diagonal long-passes to Wingbacks who are isolated one versus two, or laser passes that ask too much of Kane. An interesting player that would’ve been fantastic for England in offensive transition would’ve been the left at home Jack Wilshere, his mix of press-resistance and passing would have benefited the side from deep positions greatly, as there is no player with his skill set in the side. 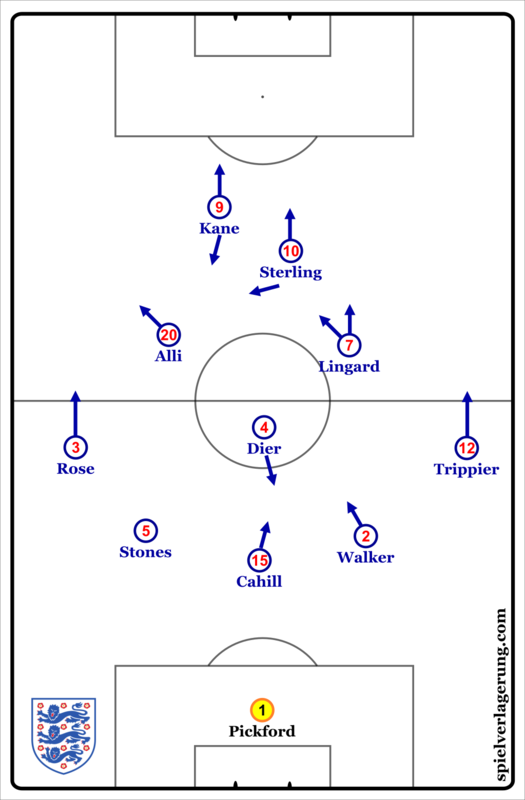 England defend in a mid to low 5-3-2 block, with a big focus on getting compact, both vertically and horizontally, with a focus on blocking passing lanes, and intense shifting from the midfield three. Very little ball orientation, only the centre midfielders would drop out of shape to press the ball carrier, the team is set up to be positionally oriented in the defensive phase. Sometimes the wingbacks would step out to press a winger, and their space would be filled by the ball near #8, but often they remained in a flat five-chain. This approach plays greatly into England’s strengths as it’s clear to see they have been clearly drilled by Southgate and Holland about what to do without the ball, this is seen in their awareness of the spacing between players, and how quickly they get compact. This may seem as a shock to most England fans, as this seems to have been neglected by past England head coaches. As well as clearly being coached well, this approach highlights the intensity and energy that Lingard, Alli and Chamberlain prior to his inury exert in their midfield shifting to block passing lanes and cover spaces. Southgate seems to recognise that maybe his defenders are not that good individually as the key focus of England’s defensive approach is to always secure numerical superiority in the last line. As with any team playing a back three, England’s wide areas behind the wing back are very exploitable, this was seen in the game against Nigeria, especially in the second half with Moses having the run of the sideback he lined up against. While England do have the advantage of playing actual full-backs as wingbacks, rather than utilising “failed wingers” both Trippier and Rose can be neglectful of their defensive duties, often leaving huge spaces for the sidebacks to cover. This is often fine of the right-hand side, as Walker is a very strong 1v1 defender, and has the physical attributes to cover vast spaces. The same cannot be said on the left-hand side, a quick and skilful winger going 1v1 with Gary Cahill is the stuff of nightmares for England fans, Cahill is a very strong 1v1 defender, but when tasked with covering space, his usual choice is to drop deeper and deeper, which will lead to chance creation against any decent wide player. England are very quick to recover back into their shape, after a ball loss, but maybe are a bit too reliant on individual quality to win the ball back, rather than a coherent organised shape. Writing this analysis was tough due to my impartial nature towards England, I don’t expect England to get too far, this is maybe a tournament too early for this squad and manager, by the time of 2022, most of the squad will be in the prime ages of their careers at 27/28, and it seems that if England do get past the round of 16, they will have to play one of the tournament favourites in Brazil or Germany. My biggest hope for England this tournament is to go and see a side that play with smiles on their faces and enjoy their football. This is the youngest and most exciting team England have had at a major tournament for a long time, a lot of the players are coming off successful club seasons, and they are unburdened by past failure, even the nations media have let them be in the build up to the tournament (Unless you are Harry Kane or Raheem Sterling). England, in this system designed by Southgate could be one of the most entertaining teams in Russia this summer, they are fairly solid without the ball, but have exciting talents and goal scorers which would lead to a very exciting summer for England fans.